This is the first of 52 biographies of British Prime Ministers, from Sir Robert Walpole to Gordon Brown. Written by members of History & Policy, a 500+ strong network of expert historians, these new, succinct bios will be published over the coming months. Each describes the major issues facing the PM at the time, his or her successes and failures in office, as well as personal characteristics. The series will offer readers of the History of Government Blog clear analysis and interesting insights into how Britain’s Prime Ministers have ruled across nearly 300 years. Today often viewed as the first British Prime Minister, Walpole was described by contemporary opponents as the ‘Screen-Master General’, adept at pulling all the political strings. 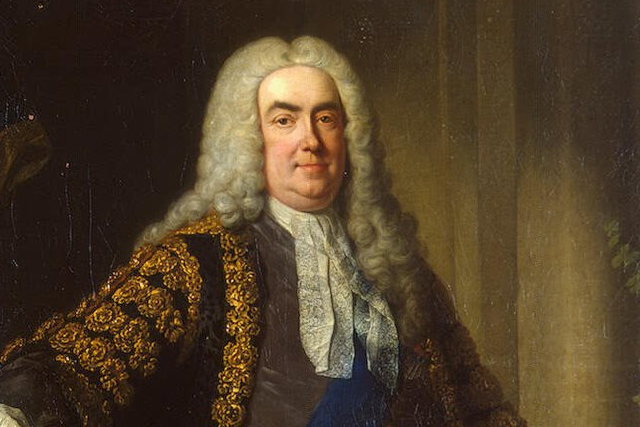 Sir Robert Walpole, first Earl of Orford, was born on 26 August 1676 at Houghton in Norfolk. His father, another Robert, was a prominent Norfolk landowner and MP. Robert junior was admitted to Eton in 1690, becoming a King’s Scholar. He entered King’s College, Cambridge in April 1696, but his university education was cut short by the death of his eldest brother in 1698. Walpole returned to Norfolk, now the heir, to learn how to manage the family estates and married the daughter of a wealthy timber merchant, Catherine Shorter, soon afterwards. The death of his father in November 1700 helped his political career, as he took his place as MP for Castle Rising in 1701. At the general election of 1702 he secured the seat at King’s Lynn, which he was to hold, with a short intermission in 1712, until February 1742. Walpole’s father had been a Whig, a supporter of the 1688 to 1689 ‘Glorious Revolution’ which gave Britain a constitutional monarchy. Robert junior inherited those views, although he was also perceived as a political moderate and an efficient administrator. His political rise was swift. He became Secretary at War in 1708 and Treasurer of the Navy in 1710 to 1711. However, his involvement in the prosecution of Tory preacher Henry Sacheverell had consequences. The Tory government elected in 1710 targeted Walpole: he was found guilty of corruption and briefly imprisoned in the Tower of London in 1712, becoming a Whig martyr in the process. The accession of the Hanoverian King George I in 1714 returned the Whigs to power. Walpole was appointed First Lord of the Treasury and Chancellor of the Exchequer in 1715, but followed his brother-in-law and political mentor, Charles, 2nd Viscount Townshend, into opposition in 1717 when the Whigs split. He resumed office as First Lord and Chancellor in April 1721 and retained both positions until February 1742, an unusually long tenure by any standard. This return to office coincided with the serious financial crisis following the South Sea Bubble and Walpole played an important role in restoring government credit. His skill in retaining office when George I died in 1727 was noteworthy in an age when a new monarch typically meant a new administration. His approach to politics relied on careful management of the House of Commons and a tendency to avoid confrontation where possible. He cultivated backbench support carefully and enjoyed fine wine and good company. He tried to keep taxes low for landowners and was sceptical about the benefits of an expansive foreign policy, knowing that he had to sell the policy (and taxes) to Parliament. Traditionally regarded as the first Prime Minister, Walpole lived in 10 Downing Street from 1735 having insisted that it become the residence of the First Lord of the Treasury, rather than being given to him personally. Royal support helped him survive a serious crisis over his tax plans in 1733, but in 1742 a combination of opposition from the Prince of Wales and a deteriorating foreign political situation forced his resignation. George II raised him to the peerage as Earl of Orford and he remained a close confidant of the King until his death in 1745. Gaming Act 1738: an act for the more effectual preventing of excessive and deceitful Gaming. In 1712, he was impeached for corruption and spent some months in the Tower of London after he led the opposition in Parliament to the Tory administration of 1710 to 1714.